I’m sitting at Heathrow Airport waiting for my flight to the US, volcano permitting, reflecting on the week. It’s been a busy week on multiple levels. 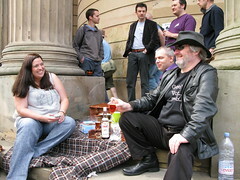 Last weekend I was up in Liverpool at OggCamp, where the photo to the right was taken after my keynote address – one of the delegates had brought a full picnic basket and we sat eating cake and drinking Pimms on the steps in the centre of the city. OggCamp was a great event, full of energy, enthusiasm and optimism (which I almost felt sad to be damping with my pessimistic views on the future of our freedoms). An unconference created on-the-spot by the attendees,, it was well worth the trip to Liverpool (despite the Millwall “fans” on the train home). I’d recommend attending next year. Following OggCamp I went abroad for the start of the week, spending an intense three days with some really great people talking about a very exciting set of plans and ideas we share. I’ll be announcing full details on Monday when I’ll have two pieces of news I find tremendous. The week ended with the general election in the UK. No political party has overall control in Parliament and I view that as the best outcome from a bad set of options. The politicians have the chance to create consensus-driven minority-led government, if they choose to set their egos and power-lusts aside. Drawing together the views of many individuals is exactly what’s needed to deal with the hard problems that face us – participating in a highly-meshed global economy, providing security in a connected society without eliminating privacy and rights, conducting politics in a diverse and rapidly changing society. For those sorts of problems, we need people who understand the connected society first-hand rather than from the dinner tables of the powerful. I think that a Parliament where respect for the views of many is an essential predicate for progress is actually what we need, rather than the hollow bluster we heard from the political parties.